In a major breakthrough the Crime Branch of Chandigarh Police under the supervision of DSP Sh. Pawan Kumar team headed by Insp. Amanjot Singh is able to arrest the most notorious International Cheaters who are recently involved in sneaking of different ATM machines by putting a skimmer and spy camera in the ATM room. Miclea Lecian Lonut S/o Loan R/o Lenuta Liliana STR Tlarilor NR- 20 BL-7, Brasov Romania, Age 37 years. Paraschiv George Aletandru S/o Gelu Glodei 13 Brasav Romania. Age 37 years. Recently on 4.8.2018 a complaint was received that someone has installed two external devices i.e. skimmer and spy camera in the Canara Bank ATM machine which is installed in SCO No. 117-119, Sec.17, Chandigarh. On the basis of this complaint the case FIR No. 262 dated 8.8.2018 u/s 420,511 IPC PS-17, Chandigarh got registered. In this regard the CCTV Footage installed in the ATM Room was examined and it has been found that two different persons are fitting these external devices to sneak the data of the ATM users. Similar complaints were received in Police Station Manimajra i.e. case FIR No. 339 dated 06.08.18 u/s 66 (C) 65D IT Act 420,511 IPC and Police Station Sec.36, Case FIR No. 287 dated 04.08.18 u/s 420,511 IPC Chandigarh. 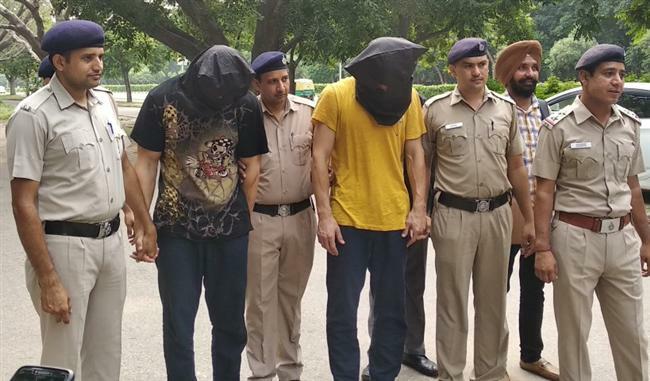 Keeping in view the gravity of the crime, Crime Branch of Chandigarh Police collected information about such persons and on the basis of the information collected from the sources, it has come to notice that it is handy work of an International Gang and the persons who were involved in pilferage of ATM Data by using spy devices are Romanian Nationals. Further on the basis of this information entire record of the persons who visited in India in recent days were collected and on the basis of this record, it was established that two such persons namely Miclea Lecian Lonut and Paraschiv George Aletandru resided in the Hotels in Chandigarh i.e. Metro Sec.35 (Check-In Date 2.8.2018 Check-Out date 2.8.2018) and Western Court, Sec.43, Chandigarh (Check-In date 2.8.2018 and Check-Out date 5.8.2018) Western Court (Check-In date 7.8.2018 and Check-Out Date 7.8.2018). Further more information was developed and it has been established that both these persons were residing in Vasant Kunj, New Delhi, on this information the team was immediately sent to New Delhi and these two persons who were residing in Hotel Glitz Westend Inn, NH-8 adjoining Shiv Murti Mahipalpur, Ranguri, New Delhi were arrested and brought to Chandigarh..
On interrogation they have disclosed they arrived in India as visitors and further arrived in Chandigarh on 2.8.2018 with the intention to collect ATM data by putting spy devices and left Chandigarh on 5.8.2018 and again visited Chandigarh on 7.8.2018 with the purpose to collect the devices installed in different ATM machines. But all the devices have already been detected by the Bank Branches and have been removed from the ATM machines. It has revealed during the interrogation that after collecting the data they use to make a clone ATM cards and further use these cards for online shopping or withdrawing money internationally. To dodge the police and to confuse the bank employee they have purchased many accessories like caps, spectacles and even one wig which was used by them while putting these spy devices in the ATM rooms, so that if their footage comes out nobody able to recognize them or the investigating agencies will get confused about the identity and the numbers of persons involved. Caps, wig used by them for changing their outlook and the clothes worn by them at the time of fitting these devices were recovered. Both of them were produced before the duty Magistrate and their 3 days police remand was obtained, investigation in the case is on and more information will come out after their interrogation.